Does Kush Audio's expertise in designing analogue equipment translate into the plug-in realm? With quality offerings on the market from Universal Audio, Waves, Slate Digital and IK Multimedia, to name but a few, we're now spoiled for choice when it comes to software emulations of analogue outboard gear. Despite this, I've yet to hear anything that is genuinely the equal of its analogue hardware equivalent: impressive, perhaps, and certainly usable — but neither wholly accurate, nor as subjectively pleasing for many tasks. This is particularly the case when deliberately 'pushing' a dynamics processor in search of interesting sonic textures. Greg Scott of Kush Audio has been involved in the design and manufacture of some of the finest outboard of recent years, and he feels the same way. Yet he also sees capability in software that an all-analogue design team can only dream of. His first foray into the world of plug-ins, UBK1, therefore, doesn't ape a particular outboard processor. Instead, the aim was to draw on Kush's analogue expertise to create a completely new plug-in processor. The result is both wonderful and intriguing. Available in RTAS, VST and AU formats, UBK1 can be used on a Mac or PC, and requires a second-generation iLok USB key for authorisation. At first glance, it looks like a typical analogue-modelling plug-in. There are three distinct sections: the leftmost is labelled Saturation, the central section Compression, and that on the right Density. Each can be individually bypassed by clicking its meter, which appears illuminated when on and dulled when bypassed. Bypass all three sections and you can still hear a subtle analogue-like sweetening; to fully bypass UBK1, you'll need to do so within your host program. The main controls come in the guise of Bakelite-style knobs and switches, and the GUI looks very retro-analogue. In fact, the whole thing looks like an homage to some mythical outboard processor. If this sounds very familiar, please stifle your yawn, because in use, it soon becomes apparent that this is no typical compressor/limiter. Not only are there no attack or release controls, but everywhere on the interface you'll find subjective descriptions instead of figures and technical terminology. Even the meters, which on first glance look like typical VU needle types, are deliberately vague, having little more function than to give a rough guide to the amount of processing being applied in that section. This is intentional: Scott wanted the plug-in to feel friendly and intuitive, but also wanted the interface to force the user to experiment and make sonic judgements using ears alone. The Saturation section features a Headroom control, which is used to find the distorting 'sweet spot'. Some will click with the interface straight away, but those who are accustomed to working with quantifiable values for attack, release and so on might take longer to get to grips with it. Nonetheless, when you've managed to unfurrow your brow, I have a feeling that you'll find UBK1 a joy to use — because, despite the broad-brush controls, it's immensely controllable, and it's also capable of producing a huge range of effects, from the soft and subtle all the way to the downright stupid. I'd recommend you start by bypassing the Compression and Density sections and focusing your attention on the Saturation — and, in particular, the small Headroom knob. When this is fully clockwise, there's bags of headroom available (far more than is achievable in analogue), but as you rotate it back, this is reduced, the idea being that you can find the sweet spot that makes the processor distort in a pleasing way. Scott recommends that the Headroom is set so that the green Ample indicator flashes regularly, and the red None one flashes very occasionally. This is indeed a tactic that conveys a believable impression of driving analogue outboard to the point of distortion — and all the more so when you bring the Saturation control into play. The latter's legending runs from Subtle to Heavy, with no other indications in between. I wouldn't want to use Headroom and Saturation heavily on every source, though. In fact, there were plenty of times when I got over-enthusiastic with them and had to restore some headroom. However, you can also juggle the balance of the dry and effected sound in this section, via the knob on the left, providing another way to reduce any heavy-handedness. The limited number of Compression controls suggest — wrongly, as it turns out — that they'll leave you with less than complete mastery of your sound. There's only one main control, which you turn up for more compression, plus a supporting side-chain high-pass filter, which can be used to prevent, say, the low-frequency energy in a kick drum triggering the compressor. There's no threshold control, no input gain, and no attack, release or ratio. Instead, you select from a choice of five compressor 'curves', which aren't compressor models, exactly, but do dictate the action of the compressor, and are derived from the settings on the UBK version of Empirical Labs' Fatso. The 'curve' names hint at which famous compressors they're loosely based on. Each setting sounds very different, but all will have their uses, and you'll soon get a feel for the different flavours on offer. A recurring favourite during my tests was the Glue, which was reminiscent more of an 1176 than the SSL bus compressor I'd anticipated from the name. Again, a feature that makes this section very easy to use is its dedicated wet/dry lever. This allows you to make very fine adjustments to the balance, so you can achieve the character of compression that you want, and then simply back off the amount of 'wet' sound to taste. Finally, there's a Link control beneath the meter: engaging this is essential if you wish to prevent the phantom centre of a stereo file from constantly shifting across the panorama when really slamming things. The Density section, again, does pretty much what you'd expect, but the amount and character of this effect are governed by a knob that runs from Light to Thick, and a switch to target the Top or Mids. This can be a satisfying effect in its own right, although I found that on most sources there was far more 'effect' available here than I'd ever find myself wanting to use — and I'm certainly not shy when it comes to this sort of processing. Who needs a mixer? I found that once you've recorded and EQ'd your sources, I could do an incredible amount of work on a simple mix with nothing other than UBK-1. I liked UBK1 best for more subtle sweetening jobs, rather than shovelling the effect on with a trowel, and I found it worked very well in exactly the same situations where real analogue gear shines. On a drum bus, I was able to achieve a nicely sweetened sound with it, and the sound had a depth and solidity that many plug-ins seem to leave me wanting. When I deployed multiple instances on kick, snare and toms, as well as on the stereo drum bus, and avoided being heavy-handed with any one of them, the result was even more pleasing. The tight, yet somehow round and smooth sound I could to achieve on electric bass and guitar was satisfying, and the analogue-like sweetening is as good for vocals and acoustic guitars as any modelling plug-in I've heard to date. It also proved a rewarding tool for smoothing the 'digital corners' off electronic sources, such as soft synths and drum machines. Interestingly (because I find that this is a problem with many plug-ins), I found that I was able to use UBK1 on several different sources in the same mix without the effect becoming too obvious. Combined with the tonal coloration options, this made it possible to fill my screen with UBK1 instances and ignore my DAW's mixer for long periods. It's worth repeating that to achieve such effects, UBK1 needs to be used in a delicate way, and if you don't know what you're doing it's very easy to overcook things to the point where you start blaming the plug-in! The three separate stages naturally interact to some extent, and I'd recommend downloading the demo and experimenting with one section at a time, with the others bypassed. That way, you'll get a much better feel for what's going on, and I think this is essential if you're to get the best out of this plug-in. When you've got your head around that, the wet/dry controls, and the variable headroom make it very quick and easy to shape the sound as you wish. But perhaps overcooking things is more to your taste? Thankfully, then, you can push this device into processing territory that most real hardware fears to tread: it's one thing making a compressor breathe or pump, but it's quite another pushing it into the kind of territory that's on offer here, which I'm sure will find as many fans in pop, dance and hip-hop production as the more subtle effects will in country, folk, rock and blues. 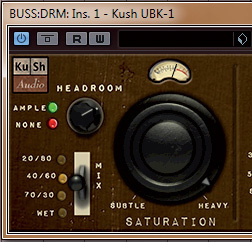 Kush Audio's UBK1 is a great-sounding plug-in, but I do feel that a few tricks have been missed. In particular, the omission of a side-chain input is a shame. The sort of pumping and breathing I was able to coax out of a slow drum loop would be wonderful for creating 'breathing' kick-triggered pad effects in pop and dance. Also, while the choice of compression curves can't be faulted, I missed the ability to fine-tune them with good, old-fashioned attack and release controls (some 'hidden' controls might provide a workable compromise, given the Kush GUI philosophy?). Finally, I experienced problems gaining access to the presets with some versions of the plug-in: they appeared in Pro Tools, for example, but not in Cubase or Reaper. That's not a huge issue, as I'm not a great believer in using presets for dynamics plug-ins (it's easy to come close enough that you get lazy...), but they're often useful in familiarising yourself with a plug-in, and are essential if you wish to follow the helpful video examples on Kush's web site. Despite there being such 'development opportunities', I already love UBK1 for what it is. In fact, I'd go as far as saying that it tops my list of favourite plug-in processors at the moment. The Headroom control is a neat and useful feature that I hope more developers will adopt, and I like the vague meters, which kept reminding me to use my ears! It's refreshing to see someone approach plug-in design in this way. Rather than struggling to make a warts-and-all copy of a piece of outboard gear, Kush Audio have thought about how to translate their hardware design philosophy into a plug-in that takes advantage of the power and flexibility available in software. Conventional modelling has its place, and will get better as time passes, but if more developers took a leaf out of Kush's book, we'd all have a better set of tools right now! Among the best plug-ins for analogue-like sound. Also capable of quite heavy-handed processing. Headroom and mix controls make it easy to fine-tune. Attractive and well thought-out graphical user interface. Issues in some formats with plug-in presets. This is a really nicely conceived plug-in that lends itself to a range of compression, distortion and sweetening tasks, ranging from the subtle to the absolutely bonkers. Full version $149. Ten-day demo version free, but requires an iLok 2. Wave Distribution +1 973 728 2425. Full version $149. 10-day demo version free, but requires an iLok 2. PC with Core i7 960 CPU and 12GB DDR3 RAM, running Windows 7. Tested with Avid Pro Tools 10, Steinberg Cubase 6.5 and Cockos Reaper 4.21.